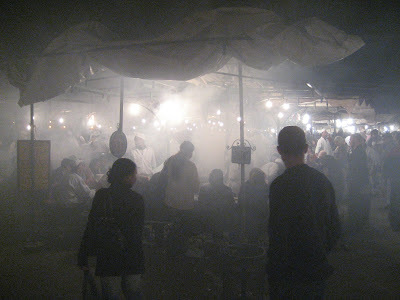 The first day I just toed the water of the food in Marrakesh. 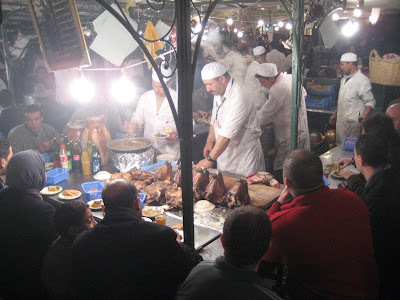 In the main square there are around 40 stalls that cook food in a billow of smoke and pushy men dressed in white trying to get you to eat there. I stayed safe and had kabobs, chicken, roasted vegitables, bread with two gespacheo like dipping sauces and tea. Night number two: I get more adventurous. I eat with the locals tonight and go for the bread stuffed with boiled potatoes, egg, oil and onions. Filling, delicious and very cheap (about $1.25). Then I head over to the snail booths section. I accidently get the large order of snail soup. While the first few dozen are hardish to get down, I get used to the flavor, taste and texture. Probobably wouldn't get it again, but not bad. Tonight? 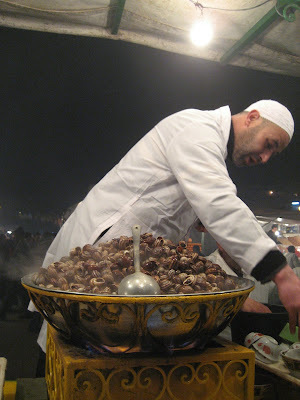 I'm trying to convience myself to go all out and get the sheeps head soup (exactly what it sounds like), but I'm not sure I have confidence in the soup, my stomach or my all night bus ride out of Marrakesh. Sheeps Head Soup. Do I dare? Sounds like you're having quite the culinary adventure. Sheep's head -- it's what's for dinner! You'll have to get the recipe so you can recreate the magic in Seattle.